Since temperatures in my locale vary so much, I decided that I wanted something that I could wear as a shirt, or a jacket. 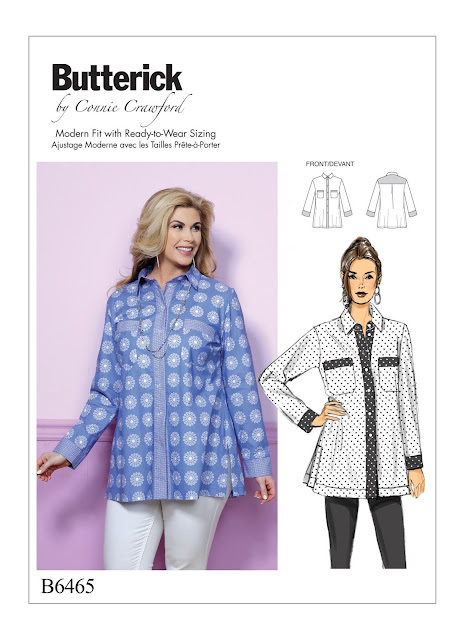 For my pattern, I used Butterick 6465. It's big enough to wear over a turtleneck, but not too big, so that if I wear it alone, it still fits fine. It has pockets, so that I can put my keys and phone in them as I walk. 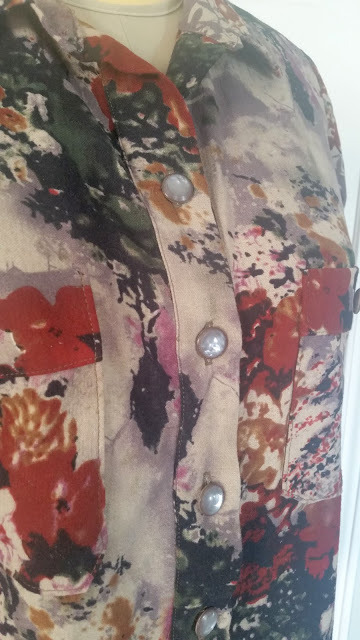 For the buttons, I used some unusual buttons that I had bought at Fabric Mart a while back when they had a designer button special. These have a marble look to them, and remind me of western snaps. They were a little larger than the pattern recommendation, so instead of 7 buttons, I used 5, and I also added them to the pocket bands. For the sweatpants, I used a heavyweight cotton olive green jersey, that, unfortunately, is sold out. It has very little stretch, and is almost like a sweatshirt fleece, but with just a brushed finish. Here are some other all cotton knits that would work for this type of pants. I also made a jacket from it, for when the weather is windy or cold. For this jacket, I used View A of Simplicity 8739. 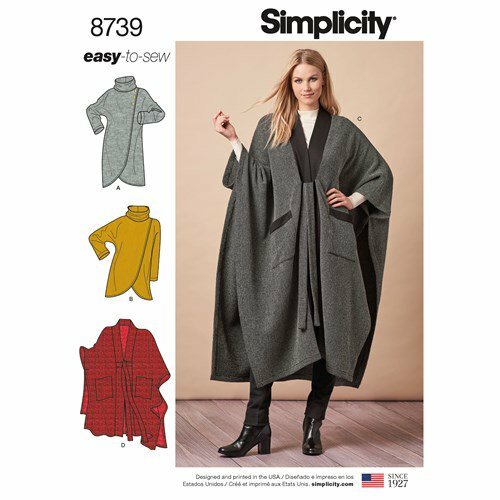 This is an extremely simple pattern! The sleeves are cut on, and the cowl collar makes the neckline very quick to sew. This would also be great made out of any kind of fleece or sweater knit. 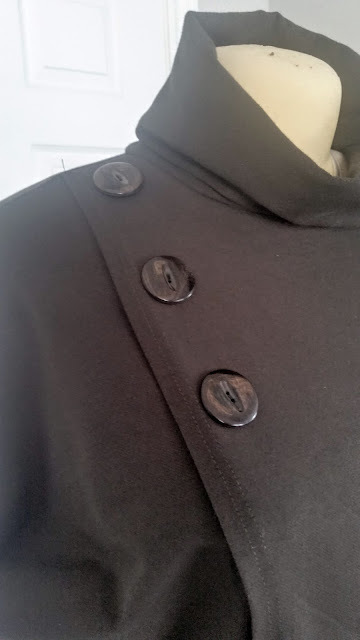 The buttons are just decorative- it pulls over the head. I used some wood look buttons to keep the woodland theme. I really liked the shape of the hem, and I added some patch pockets that mirrored that shape in the front, just in case I need to take some gloves along with me. The dark green feels right at home in the forest. If you've not seen these sticks before, these are Nordic walking sticks. I think that they are very common in Europe, but not so much here. I got mine at a local sporting goods store. They are kind of like golf clubs in the fact that you should try to get some that are the right height for you. 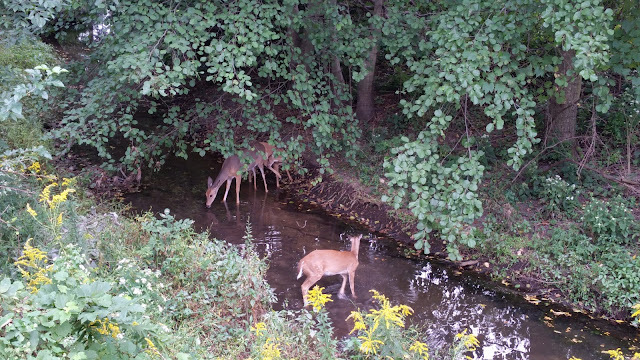 You never know what you might see- I was so excited to see this mama deer and her two babies taking a drink. I'm really looking forward to when the seasons change and the leaves change colors! I love my new woodland walk wear! I'll leave you with this sign that I saw as I left the woods, which is actually inside our city limits. I think that we sewers naturally have Sisu- we are determined and persevere until our projects are just as we want them to be! Do you like to go for walks in the forest? What's your favorite way to de-stress? I love the woods! I've never made anything for hiking, but you have inspired me to do so. What pattern did you use for the sweatpants? Love the jacket. Thanks, Susan! I used Butterick 6533 for sweatpants, but I narrowed the legs considerably, taking in about 2 inches off of both the inseam and outer leg. I had to lengthen it 3 inches as well, which is more than average, so check the length before you cut! Another great post by Ann. Always so inspired by your sewing Ann. Wow -great job on both those jackets. Very cute!! Fabulous. A few months ago I took up rewilding walks - walks designed to get you back in touch with nature. I've not yet had such a perfect picture as your mother and two baby deer. I recently bought walking poles - they're adjustable for height and you can also get ones with springs, though mine don't have those. I'm enjoying my walks. Now I need to make some walking wear!! DH asks what's the walking equivalent of glamping? Your poles sound great! I've never heard the term rewilding, but I guess that is what we are doing too. I guess the word would be glalking! Check out the styles at the high end sportswear companies like Patagonia and Northface. They have beautiful, albeit expensive, pieces to inspire!